MAF Engineers work tirelessly to make sure the large fleet of aircraft were maintained regularly and safe to fly. 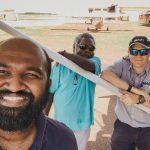 Our aircraft land in all conditions and environments, they can only do so because of the phenomenal engineering team that keep them airworthy. We now need a Training Supervisor to develop and train local aviation maintenance staff in order to improve technical skill and knowledge across the maintenance team; facilitating those eligible to become licenced engineers, and to mentor senior staff members in their roles. In addition to assist with the overall maintenance operation.